1. Great Deals and Discounts - about 90% of the time, products sold online are almost always cheaper than those sold in physical stores. I think the price difference probably has something to do with taxes and rent for physical stores. I always find myself getting awesome deals online especially for my makeup purchases. One good example is, when I find myself shopping at Nordstrom. I always make it a point to search for Nordstrom promo codes or Nordstrom discount codes before I proceed to checkout. If you are not familiar with Nordstrom, it is a leading fashion specialty retailer offering compelling clothing, shoes and accessories for men, women and children for over 100 years. And yes, they can ship orders directly to the Philippines. If you ever decide to shop online at Nordstrom, don't forget to use Nordstrom coupons to get free shipping, huge discounts, special offers, freebies and so much more. And since I already mentioned the holidays, this is usually the best time to find Nordstrom coupon codes. If you are clueless where to find the discounts, you can checkout coupon sites like Codesium. 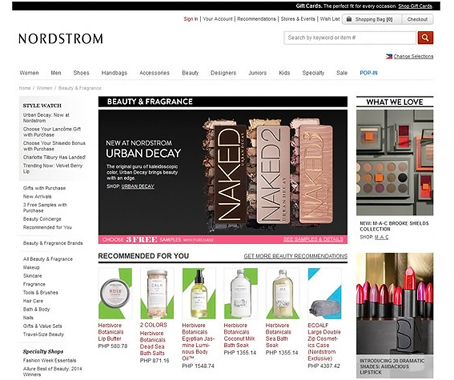 The site offers a lot of promotions and codes not just for Nordstrom, but other popular online retailers as well. So, if you are a frugal and wise buyer like me, be on the lookout for promo codes. It will definitely save you some money. 3. Shop for products that are unavailable in my area - Because of online shopping, I am now able to buy products that are not available locally here in Philippines. We now have a lot of local online resellers who brings us the most coveted fashion and beauty products. Just be sure to buy only from known Top Sellers in order to avoid being scammed. I have a friend who loves to shop online at Nordstrom because she can be sure that the items are authentic, especially if it's a high-end beauty product. The only downside to it, is that it takes longer to arrive. How about you ladies, are you fond of shopping online? Disclaimer: This is a sponsored post. I received a form of compensation from the aforementioned company. However, all editorial content are my own and written without prejudice or bias regardless of sponsor or affiliate association. nordstrom addict right here too! ^^ i wish they had more coupons tho like sephora. and i wish their point reward system applies to everyone, not just the nordstrom card holders. but other than that i love shopping from them. they have good customer service as well :) btw sis when you shop there use an affiliate site para you get extra discount pa. i earned i think around P800 na just by using it. Oooh! I do buy online but very rarely. I haven't even tried buying outside of the country. I kept on thinking about the shipping and how the local postal office would handle them. Haha! I don't wanna complicate myself pag unfamiliar pa. But this post made me want to check out Nordstrom and Sephora! I agree :) I buy almost everything online! But yeah, the price difference is because you're not paying for customer service (sales associates, cashiers, etc) and I suppose, rent too.